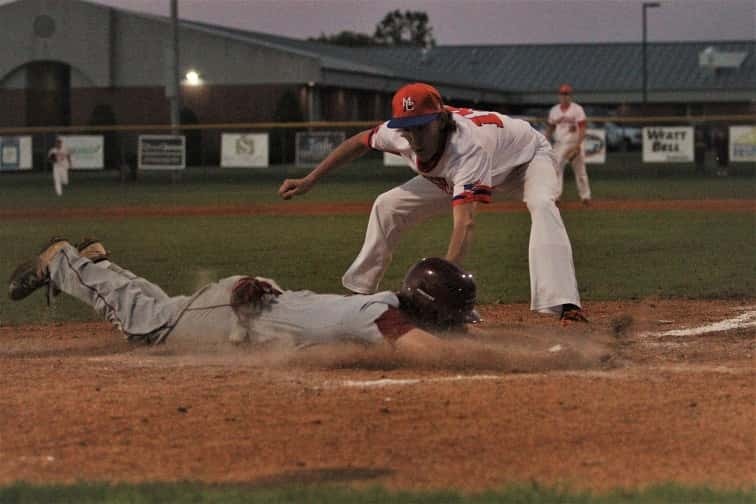 Marshall County pitcher Brock Anderson makes the tag at home plate but the McCracken County runner was safe. The First Region baseball tournament resumed play Friday following two days of postponements due to weather. 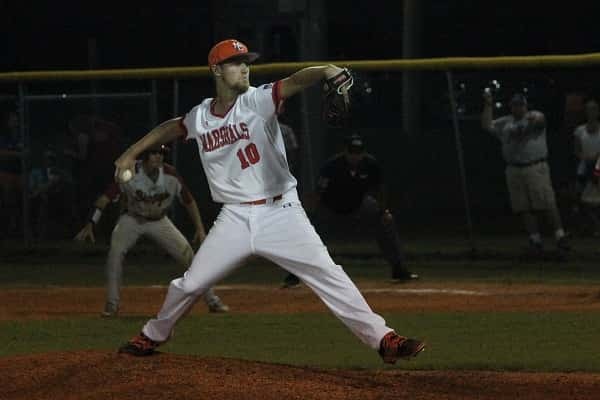 Two semi-finals games were played starting with a Paducah Tilghman 10-0 win over Calloway County in six innings before the Marshall County took the field to play McCracken County in the second semi-final. Dawson Smothers anticipates the throw from the mound for the tag attempt at first base. 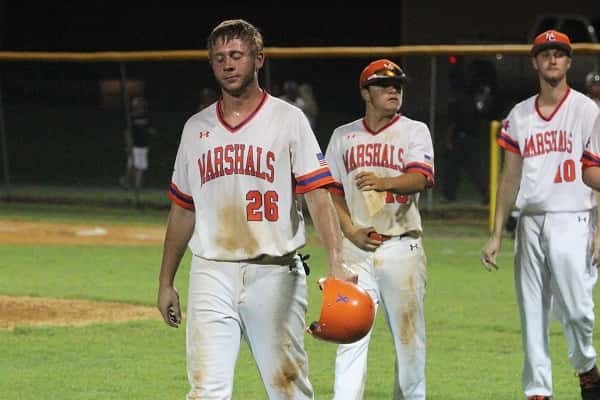 The Marshals earned their first ever win this season over McCracken County, who have been the dominant team in the region since the school’s consolidation in 2014 and are the 4-time reigning First Region champions. 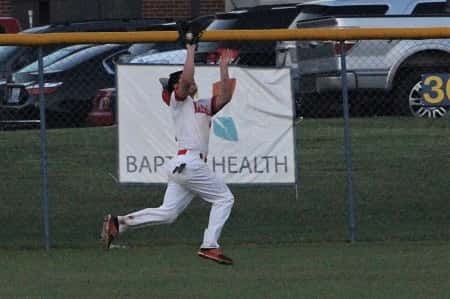 Friday they took one more step to their fifth consecutive title in a 13-1 six inning win over the Marshals. The Mustangs put runs on the board in each of the first four innings, three in the first on a wild pitch and 2-run single by Conner Dismore and added two more in the second inning on a single by Elijah Wheat and ground ball RBI by James Dodd. 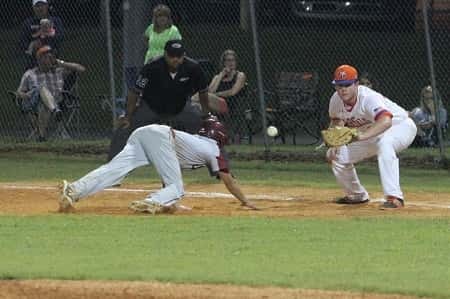 With two outs in the top of the third, McCracken County scored two more runs on a passed ball and single by Kiael Waldon to lead 7-0 before the Marshals got on the board in the bottom of the third with a lead-off double by Austin Stockdale, brought to home plate on a double by Ty Buchmeier. Austin Stockdale snags a potential hit away from the Mustangs in right field. The Mustangs sealed their fifth straight trip to the title game with a 5-run sixth inning for the 13-1 lead. Dalton Andersson gave the Marshals a spark with a double in the bottom of the sixth and fans were thrilled to see the second appearance on the mound for Griffin Ives this season, coming in for Brock Anderson in the sixth inning. Three seniors put the Marshall uniform on for a final time Friday – Jackson Beal, Dalton Andersson and Blain Bizzle. The Marshals finish the season with a record of 21-9. Griffin Ives came to the mound in the sixth inning in his second appearance for the Marshals. Senior Dalton Anderson (26) leaves the field in his final game for the Marshals.